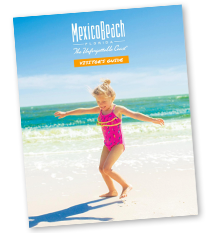 Flee the gloomy, gray skies and frigid winter weather and head south to sunny Mexico Beach along northwestern Florida’s Unforgettable Coast, where the Southern hospitality is as authentic as our Old Florida charm! Explore miles of sugar-white beaches and shimmering emerald waters. Enjoy endless activities, outdoor adventures, and getting to know the friendly locals in our pristine little corner of paradise. Quaint Mexico Beach is ideally situated far enough away from the crowds and congestion yet close enough (typically within thirty minutes) to most urban amenities such as hospitals and urgent care clinics, pharmacies, veterinarians and kennels, airports, and libraries. Rest assured, our local businesses offer various services and conveniences and will go out of their way to assist you with whatever you may need during your stay with us. When visiting Mexico Beach, we encourage you to drop by the Mexico Beach Welcome Center. Operated by the Mexico Beach Community Development Council, our Welcome Center offers visitors a resource for current information about attractions, events, restaurants and accommodations in Mexico Beach. We’re here to help answer your questions about Mexico Beach and make your visit more enjoyable! We’re also pleased to offer free internet access! Due to Hurricane Michael, Gulf Foods was destroyed. However, they are planning to rebuild! Please continue to check back as updates will be made. Mexico Beach’s only grocery store. A full service grocery with fresh produce, fresh meats and butcher on staff, as well as your typical grocery needs. We also carry a large selection of beer and wines to select from. Come browse our large selection of beach supplies and souvenirs. If there is something special you are looking for, just ask! Open 7 days a week our friendly team will be delighted to assist you with any of your shopping needs. Due to Hurricane Michael, the Shell Shack was severely damaged. However, the Hunter Family is dedicated to building back and are working on plans! Please continue to check back as updates will be made with regard to their expected open date. Sellin’ Sea Shells and Seafood since 1965. The Shell Shack has a full service seafood market that offers fresh, daily seafood including shrimp (with pack-for travel services). The shop sits right on the Canal with a beautiful view of the beach across the street. We have a wide variety of gifts and t-shirts, and yes, you guessed it: SHELLS! A must-stop shop during your vacation.